Kigali, Rwanda - Crossing from Tanzania at Rusumo Falls, Rwanda announces its arrival with authority. Sharp climbs up impeccably maintained roads play the role of welcome mat in the Land of a Thousand Hills. It is a simply gorgeous landscape, and you understand immediately an old Rwandan saying, “God is everywhere, but Rwanda is God’s home.” But sixteen years ago, Rusumo Falls would have triggered much different sentiments. 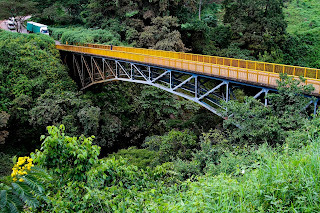 The bridge at Rusumo Falls is a haunting place for those that know the history of the 1994 Genocide. It was here that 500,000 Rwandans fled into Tanzania to escape 100 days of unimaginable bloodshed. While thousands crossed the bridge seeking refuge, the bodies of those less fortunate floated by in the rapids below. The bridge would be nondescript if not for its unfortunate status as an iconic symbol of the Rwandan Genocide. Short, yellow, narrow (but a wonderful piece of scenery), it is hard, if not impossible, to imagine one of the greatest travesties in human history occurring at places like Rusumo Falls. Two days later, we take a walk up to Nyamarambo Stadium in Kigali to see the quarter-finals of the MTN Peace Cup, an annual knock-out cup competition between all the football clubs in Rwanda (like the FA Cup or US Open Cup). Today’s match pits Araco Sport versus Entilles FC; the former club known as the “taxi men” because it is a team of/for the matatus (mini-bus taxis). The small stadium has a ‘FieldTurf’ pitch and is pleasantly framed by the surrounding hills and neighborhoods. The crowd is sparse (we later learn that the match is free after the second half kickoff – so most casual fans just wait) but the small group of supporters are boisterous and loyal to the cause. 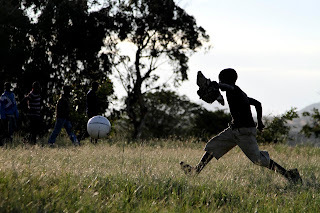 The quality of football is poor, as it is throughout east Africa unfortunately. Yet, there is a massive spirit about the game; a fact illustrated by the full-blooded tackles by everyone on the pitch and the occasional spat between a few rival fans sitting not too far from us. Rwandan football is alive and kicking. Watching Entilles put several goals past the hapless Araco goalkeeper; we reflect on our trip to the Genocide Memorial the day before and wonder about how football has (or has not) played a role in Rwanda’s remarkable resurgence. Sitting on a hillside near downtown, the Kigali Genocide Memorial is a living sanctuary complete with museum exhibits, memorial gardens, mass graves, and an education center. Understated and soft, the grounds are dignified and stoic and force you to take pause before entering the main building. Taking a moment to collect your thoughts is a good idea because the Memorial pulls no punches. Just in case we were not fully prepared, we notice Rwandans and foreigners all exiting the building in tears or shocked silence. The Genocide Memorial is in a word, unforgettable. 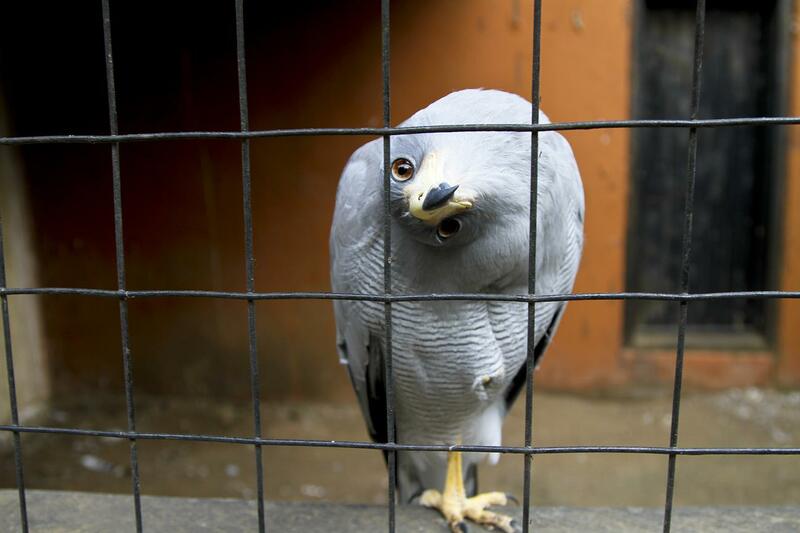 Within the winding tour, you learn about the omens leading up to and the lack of response by the international community to the 1994 Genocide. You meet survivors and hear their stories. You see the remains the artifacts of those that perished. Rwanda’s schism and path to destruction is laid before you with simplistic brilliance. On the second floor an exhibit called “Lost Futures” eulogizes the children who “might have been national heroes.” Bernardin Kambanda was a clever 17-year old who loved football. He was killed with a machete in a church in Nyamata. 10-year old David Mugiraneza wanted to be a doctor, loved making people laugh, and played a many game of football. His final words before being tortured to death were, “UNAMIR (United Nations Mission in Rwanda) will come for us.” The list goes on. And on. The Rwanda Genocide claimed the lives of almost 1,000,000 men, women and children. More than that were raped and tortured. 2,000,000 fled their homes to Tanzania, Burundi, Uganda and Congo. In 1994, Rwanda’s population was 7,000,000. The genocide lasted just 100 days. The Kickabout team remembers the summer of 1994 because of the first FIFA World Cup to take place in the United States. Sweltering heat at Giants Stadium, the Argentina-Netherlands match in Dallas, the horrific “denim” jerseys worn by the Americans, and the Colombia own goal that lead to murder. It was the summer soccer arrived in the U.S. of A. While the rest of the world played, Rwanda bled. Sixteen years later, and we are here to celebrate the FIFA World Cup in Africa for the first time. We find ourselves in Rwanda and bear witness to her amazing recovery and reconstruction. You wander the streets of Kigali and it is impossible to imagine the roadblocks, the murdering hordes, the panic of those destined to die. While the scars are still visible, so is Rwanda’s progress. We absolutely love it here. Perhaps that’s why football being just football feels so right. It’s just a game because that’s what Rwanda needs – to play, to have fun, to win, to lose, to put in strong tackles, to get up and try again. After the match, the winning team’s supporters roll through town in the back of pick-ups singing, honking, blowing horns, waving flags, and chanting songs of victory. 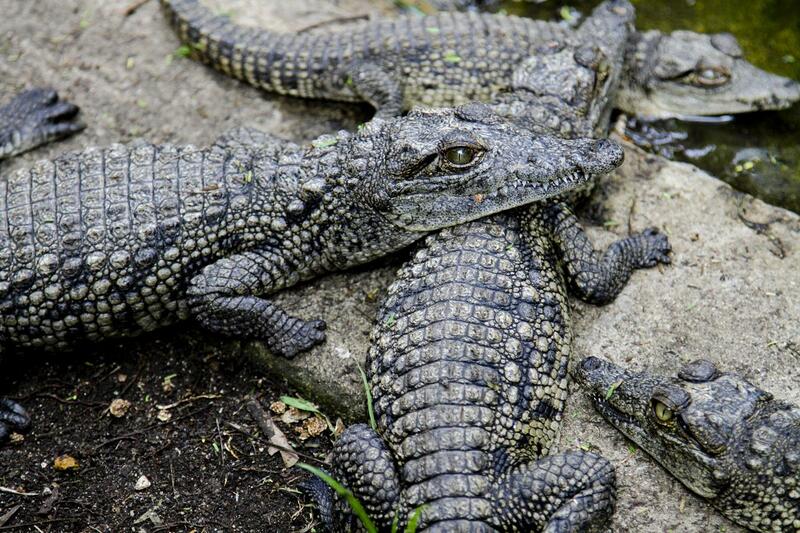 This is not an uncommon scene anywhere in the world. But sixteen years ago, such a scene symbolized the brutal violence that engulfed this beautiful land and its beautiful people. 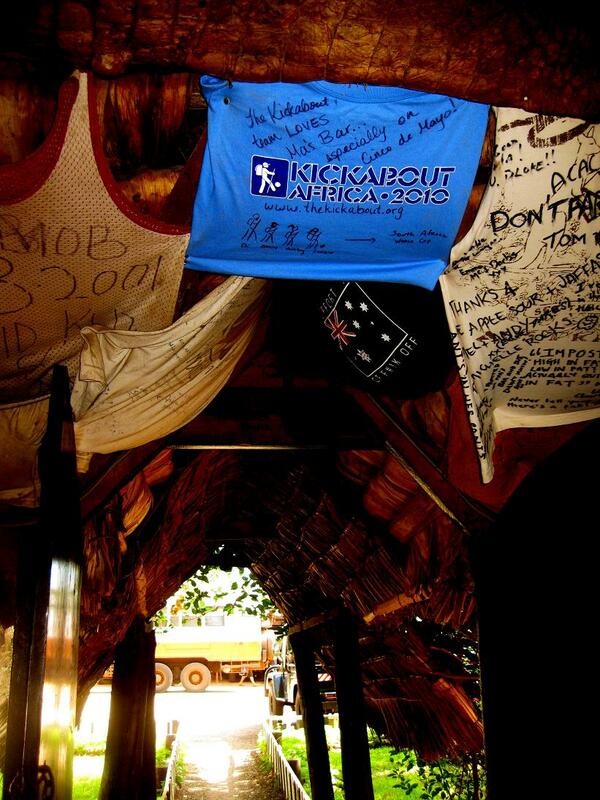 From Martin’s Cozy Place (Addis Abba, Ethiopia) to Mayoka Village (Nkhata Bay, Malawi), Kickabout has squatted, camped, invaded, and crashed in places throughout east Africa. Some have been pretty posh (Utengule Coffee Lodge in Mbeya, Tanzania) while others have been less so (Mzoozoozoo in Mzuzu, Malwai). 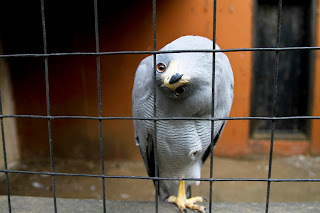 We have yet to meet an unfriendly innkeeper, and for the most part, we’ve made new friends at every stop. One type of place, however, has really earned our respect and future business: the “Drink for Charity” Lodge. 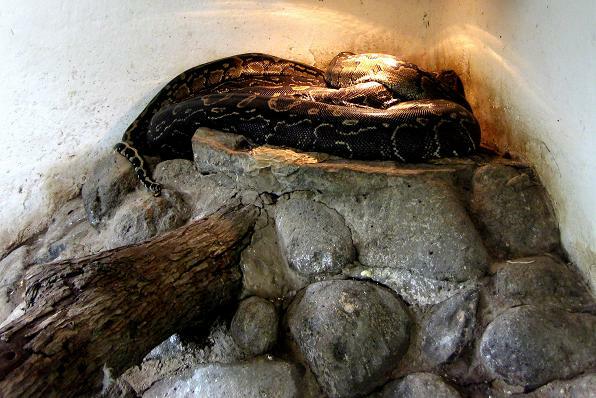 Just outside of Arusha, Tanzania (30km west) you can find Meserani Snake Park. Run by Ma and BJ for the last 18 years, Snake Park is a wild compound composed of campgrounds, a legendary bar, a mechanics’ shop and the best collection of poisonous snakes we’ve ever seen. There’s a $5 entrance fee to see the snakes, birds, crocodiles, and turtles – but the camping is free. The kitchen is limited, but the bar is fully stocked with beer and liquor. 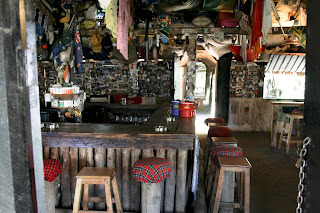 The bar and ‘zoo’ alone is worth a stop, but what puts Snake Park on Kickabout’s “Top Places to Stay” list is its connection to the local Maasai community. Overland travelers like a good drink. And they know that good drinks are not solitary creatures and enjoy company, especially other good drinks. And the Kickabout crew is nothing if not loyal and well-trained overland travelers. So when we learned that proceeds from Ma’s Bar at Snake Park funded local community projects, we turned our affinity for cold beer into funds for a cultural museum, ladies’ craft market, health clinic, and classroom construction project. Talk about a return on investment! The Maasai Cultural Museum and Ladies’ Craft Market sits just outside the gates of Snake Park. A local Maasai warrior takes you on a tour of the museum and, for a small fee, on a Maasai walk to learn more about Maasai culture today. (If you fancy a camel ride, they have those too.) Fifteen families own their own shops at the craft market where you can buy wood carvings, jewelry, bowls, fabrics, etc. While the prices are higher than what you can find on the side-of-the-road stalls, the proceeds from this market enable the women to make a decent living and pay for their kids' education. There is also a medical clinic that treats 800-1000 patients a month. Free of charge. Medicines are purchased by Snake Park via our early afternoon soda, our happy hour cold beers, and our whiskey night cap. Ma’s watering hole also pays for the construction of new water wells. A couple of years ago, BJ led the drilling of a new borehole to alleviate the water needs of nearby Eluai Village. The resulting well produces 4800 liters per hour, enough for Eluai and neighboring Emerete Village. Other projects include building new classrooms to ease the overcrowding in the local primary and secondary schools and hopefully, a home for children orphaned by AIDS. Cheers to that, Ma. We’ll have one more. 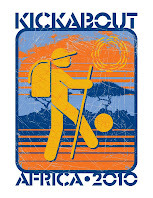 Have you ever donated or been asked to collect soccer balls to send to a community or organization in Africa? Kickabout would like to introduce you to Alive & Kicking, a Kenyan organization that makes soccer balls created entirely with Kenyan resources. 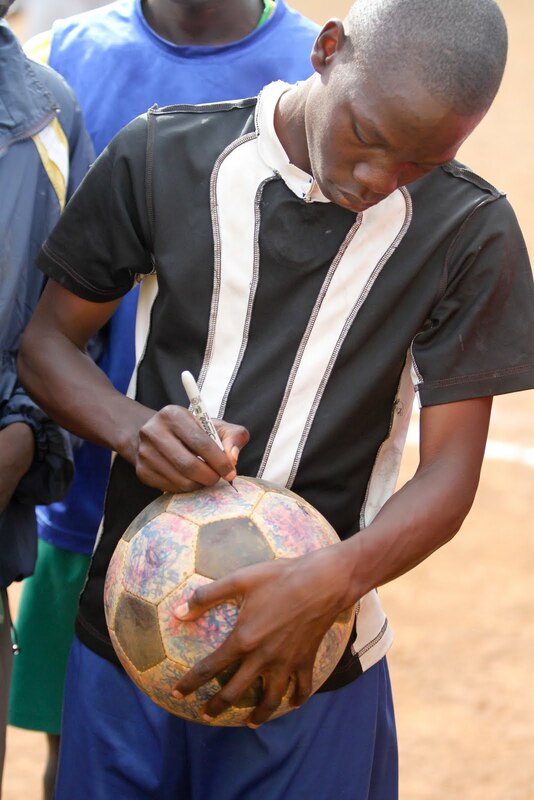 Hand-stitched by artisans, made with local rubber, and designed to be easily repaired (as the rough 'pitches' tend to rip through our mzungu footballs with ease), Alive & Kicking is wonderful example of a holistic approach to sport for development. During our Nairobi ‘staycation,’ we got the chance to meet up with our good friends at Spirit of Football and The Ball. For the last three FIFA World Cups, a single football makes its way from the birthplace of organized football to the biggest sporting event on the planet. This is The Ball. 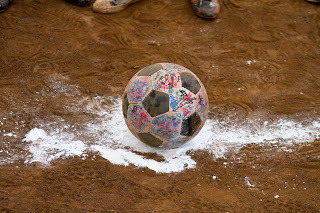 On every journey to the World Cup, many thousands of ordinary people make direct contact with The Ball, whether by chance in the street or by attending events, playing with it, signing it and helping it along its way. The Ball brings the World Cup closer to people who wouldn’t otherwise experience it first hand. At the same time, The Ball introduces its audience to the great work that its partners are doing — and shows them the vibrant cultures of the places it visits. 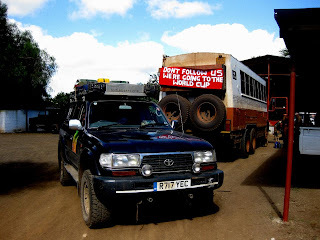 The Ball 2010 is made by the not-for-profit Alive & Kicking in Kenya. The Ball is visiting Special Olympics projects in Africa, meeting their athletes, coaches and supporters, playing many games of Unified Football and helping to break down negative stereotypes about the intellectually disabled. A simple idea. A simple game. A wonderful group of guys. An awesome Ball. Kickabout visited Alive& Kicking, where The Ball was created. More on that soon.